To this page we collect frequently asked questions about Solmukohta 2016 and AWiF. Q: When does the check in start? 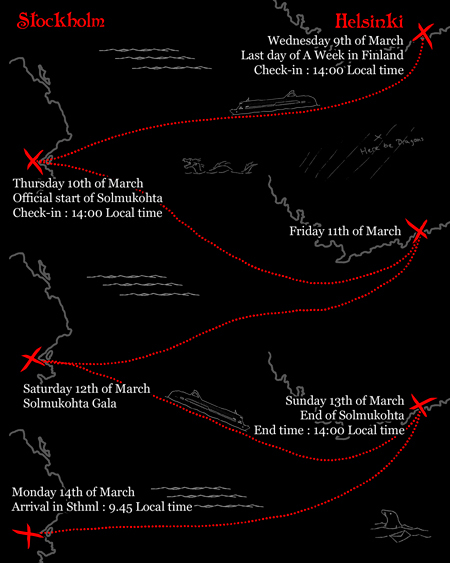 A: Check in starts in Helsinki on Wednesday 9th and Stockholm on 10th at 14.00 local time. Be at the terminal at 14.00. Q: How do I sign up to Solmukohta program items? Q: My bank needs payment recipient address, what is Solmukohta's address? Q: My bank does not agree with my payment reference number, what should I do? A: If the reference number isn't accepted, just insert it into the message field. Q: I bought a breakfast voucher but missed breakfast. Can I use the voucher somewhere else? A: Yes. You can use the breakfast voucher for food in most of the cafes and restaurants on board. If your purchase is more than 11e and you use the voucher, you need to pay the rest yourself. You can even use the voucher for a night snack if you realize during the night that you are definitely not making the breakfast, but some food would do good "right now". Q: Is there any other (cheaper) options for food than the buffet dinners? A: Yes. On board you can find several restaurants and cafes that serve food in variable prices. Most, but not all of the menus you can find from Silja's restaurant list. For example, cheap options for food can be a sushi set for 10.50 €, salad for around 8.50 € from Sushi & co, a steaming hot bowl of Salmon soup for around 10.50 € or a (veggie) burger for around 14/16 € from Cafe Mundo. If you feel like Italian, restaurant Tavolata offers meals from around €19 and above (cheaper smaller plates, starters etc). You of course have the option to visit nearest supermarket and restaurants when the cruise ship is in harbour during the day. The cruise ship has refrigerator units that work on a 2 € fee per visit, so you can bring in your own stuff to supplement / replace some of the meals. And the tax free shop sells snacks and tax free beverages free of tax. Q: Is the tap water drinkable? A: The tap water is drinkable in Finland, Sweden and on board the cruise ship. Q: I have not received my confirmation email. What to do? A: First check your spam folder. If the mail is not there, send us an email, we will fix it. A: If you find out that you can't make it to Solmukohta after all, please inform us as soon as possible. We handle cancellations on a case by case until the 1st of February 2016. After 1st of February, we can not refund tickets in any circumstances. If you find out that you cannot make it after the 1st of February 2016, let us know anyway, as maritime law requires us to list which of our participants are on board. Q: Do I get a confirmation email when I have paid? update your name (or part of your name) to our website on the Participant list. send you an email, if you wished to be anonymous. We check made payments few times a week. Please remember that international bank transfers take a few days to appear on our bank account. If you think that your name should be on the participant list, or you should have received an email, contact us. Q: I don't understand the back/forth sthlm/helsinki/helsinki/sthlm thing? A: Solmukohta 2016 cruise sails on a cruise ship between Helsinki and Stockholm. and the ship is empty of the lovely Nordic Larpers. Q: When does the sign up end? A: 1st of February 2016 is the last sign up date to SK2016. Some of the cabin classes might end, so we recommend you sign up early - and there is a soft deadline: after 15th of December 2015, the price of the ticket will rise by 10€. Q: When does the ship leave from the harbour? The Solmukohta check in on Wednesday in Helsinki: 14:00 local time. The Solmukohta check in on Thursday in Stockholm: 14:00 local time. Q: Where is the harbour? How long it takes to commute from the airport to the harbour? A: Answer to this question is findable right here on the Harbours -page. A: The following prices are for the cabins only, and don't contain the base signup fees. Please drop us an email if you want to proceed.